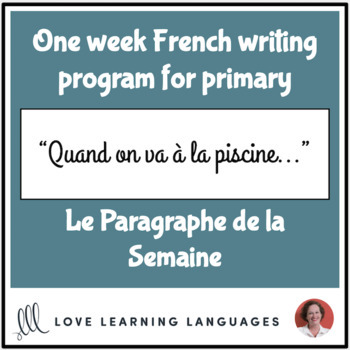 This one week French writing program will have your students writing every day of the week, and is perfect for French immersion. The writing activities in this program include five pre-writing and writing activities for Monday through Friday. These writing prompts are a great way both to introduce and to review writing. Provide each student with a "paragraphe de la semaine" folder and have them add to it every day as you give them daily assignments. At the end of the week have them turn in their folders. Have a look at the video preview to see this resource in action! ✍Lundi: Je dessine - Give students a drawing page with a writing prompt at the top. This will have them beginning to think about the writing theme for the week and is their first pre-writing assignment. Kids love drawing, and the pictures they draw will later serve as inspiration! ✍Mardi: Mon livret de vocabulaire - Each student receives a booklet to help them explore the vocabulary related to the week’s writing theme. The front page includes the writing prompt of the week and an image. The second page includes over 80 frequently used French words. Page three lists 12 words that go along with the theme of the week, and the back page has space for ten words that students have either thought of on their own or looked up in the dictionary. The booklet is a simple one page printable that you can either fold in advance or have students do it on their own. Kids write their name on the front cover and you could have them color it. ✍Jeudi: Mon brouillon - Students write a rough draft of their paragraph using the vocabulary words selected on Wednesday. The brouillon page includes a 5 point checklist at the top for students to evaluate their work for themselves before writing the final copy on Friday. This will motivate students to look over their work and make corrections. ✎ Enhance your writing program by practicing a little every day. ✎ Use the prompts at writing centers Monday - Friday. Check out my new Build Your Own French Bundle option. Select resources from my store, and if they total $20 or more I'll quickly create a special order bundle for you at 20% off. No sale items or other already discounted bundles can be included. ➯ Just click here to follow my store! LICENSING TERMS: This purchase includes a license for one teacher only for personal use in their classroom. Licenses are non-transferable, meaning they can not be passed from one teacher to another. No part of this resource is to be shared with colleagues or used by an entire grade level, school, or district without purchasing the proper number of licenses. Want to get TPT credit to use on future purchases? Go to "My Purchases" and log in. Next to purchases there is a link to provide feedback. Click this link and you will be taken to a page where you can give a rating and leave a comment for the product. When you give feedback TPT gives you credits that you can use toward future purchases.